Feb 23-25, 1988 : Tendulkar (14) and Vinod Kambli (16) compile a 664-run unbroken partnership for Shardashram Vidya Mandir against St Xavier's at Azad Maidan, Mumbai. Kambli remains unbeaten on 349 not out and Tendulkar scores 326 not out. It remains the highest partnership recorded in any form of cricket, until in November 2006. Dec 11, 1988 : Makes first-class debut at the age of 15 and scores an unbeaten century against Gujarat at the Wankhede Stadium. Becomes Youngest Indian to make a hundred on first-class debut. Nov 15, 1989 : Makes his Test debut in Karachi against Pakistan at the age of 16. Makes 15 on debut. Dec 14, 1989 : Suffers a bloody nose in the last Test in Sialkot after being hit by Waqar Younis. Makes 57 in the innings. August 14, 1990 : At the age of 17 years and 112 days, becomes the then second-youngest to score a Test century. He scores 119 not out against England at Old Trafford which helped India to get a draw. April, 1992 : Signs up for Yorkshire and becomes the first overseas signing for the English county. Nov 27-28, 1992 : Becomes the youngest player to score 1000 Test runs at the age of 19 years and 217 days after he scores 111 in India's 227 in Johannesburg. Feb 11-12, 1993 : Gets his first Test century (165) at home against England. Nov 24, 1993 : The world saw the first glimpse of Tendulkar as a match-winning bowler. Bowls India to sensational last-ball win against South Africa in the Hero Cup semi-final. South Africa needing six runs to win off the last over, Tendulkar gave them just three, and India a victory. March 27, 1994 : Opens the innings for the first time in an ODI against the New Zealand. Scores 82 off 49 balls. October 1995 : Becomes the richest cricketer in the world after he signs up a five-year contract worth Rs.31.5 crore with WorldTel. Feb-March, 1996 : Plays his first World Cup at home and scores 523 runs at an average 87.16 and becomes the highest scorer. Aug 8, 1996 : Becomes the Indian captain at the age of 23. Jan 2, 1998 : Sacked from captaincy after a 15-month stint during which India won just three of 17 Tests. Feb-March, 1998 : In the best of his form against Australia in a home Test series and also gets his maiden double hundred. He also scored two hundreds and a fifty in the three-Test series that India won 2-1. July 28, 1999 : Gets back his captaincy after Mohammad Azharuddin is sacked for India's failure to reach the semi-finals of the World Cup in England. March 20, 2001 : Scores a thrilling century in the deciding Test in Chennai and denies Australia the "final frontier". March 31, 2001 : Becomes the first payer to score 10,000 runs in ODIs en route to his 139 against Australia in Indore. Nov 19, 2001 : Fined by match referee Mike Denness for ball tampering. The decision was later overturned after an outcry by the Indian cricket board. Aug 22-23, 2002 : Surpassed Don Bradman's tally of 29 Test centuries. Misses double-century by seven at Headingley, but India win by an innings and 46 runs. February-March, 2003 : Scores 673 runs at 61.18 in the World Cup and also takes India to sniffing distance of winning the crown. His 98 against Pakistan was one of the best knocks played by Indians at World Cup. Australia are the champions, but Tendulkar is named the Man of the Series. Aug, 2003 : Is presented with a Ferrari 360 Modena for going past Bradman's 29 Test centuries. Jan 2-4, 2004 : Scores 241 in Sydney, one of his best, even as Australia manage to hold on for a draw, and the series ends 1-1. Aug, 2004 : Suffers from tennis elbow during the Videocon Cup in Holland. Misses the Champions Trophy in England, and then the first two home Tests against Australia. March 16, 2005 : Scores 52 against Pakistan and becomes the fifth man to score 10,000 Test runs. May, 2005 : Goes for the surgery for the tennis elbow. Dec 10, 2005 : Becomes the highest centurion in Test cricket as he overtakes Sunil Gavaskar's 34 en route to his 109 against Sri Lanka in Delhi. March 19, 2006 : Is booed at the Wankhede Stadium after he was dismissed for duck in 33 minutes against England in Mumbai. March, 2006 : Again goes under the knife. This time for surgery on his right shoulder in England. May, 2007 : For the first time in his career, Tendulkar is rested for the three-ODI series in Bangladesh. Jan 4, 2008 : Scores an unbeaten 154, against a major Test playing nation in two years and 19 Tests, against Australia at the Sydney Cricket Ground. March 2, 2008 : Sachin scores his first ODI century in Australia, in first of the CB Series final. Oct 17, 2008 : Surpasses Brian Lara's record of most Test runs against Australia at Mohali. Nov 5, 2009 : Gets to 17,000 runs during his 175 off 141 balls in a 351-run chase against Australia in Hyderabad. India fell short by 19 runs. Feb 24, 2010 : Becomes the first player in the history of the game to score 200 in a single innings in a one-day international. He took 147 deliveries to power India to 401 and a 153-run win against South Africa. Oct 2010 : Tendulkar bags his first ICC award, the Sir Garfield Sobers Trophy. Dec 19, 2010 : Gets his 50th Test hundred against a difficult South African attack in Centurion. April 2, 2011 : Realises his childhood dream of winning the World Cup that too at his home town of Mumbai and at the Wankhede. India beat Sri Lanka to win the World Cup for the second time. March 16, 2012 : Gets the 100th international century, scoring 114 in an Asia Cup match against Bangladesh in Mirpur. But India lost the match. The century came after 34 innings and more than a year after scoring his 99th international hundred. Dec 23, 2012 : Just minutes before the selectors were set to name the squad for the ODI series against Pakistan, Tendulkar announces his retirement from the format. Tendulkar finished with 18,426 ODI runs and 49 hundreds, well clear of any other batsman. 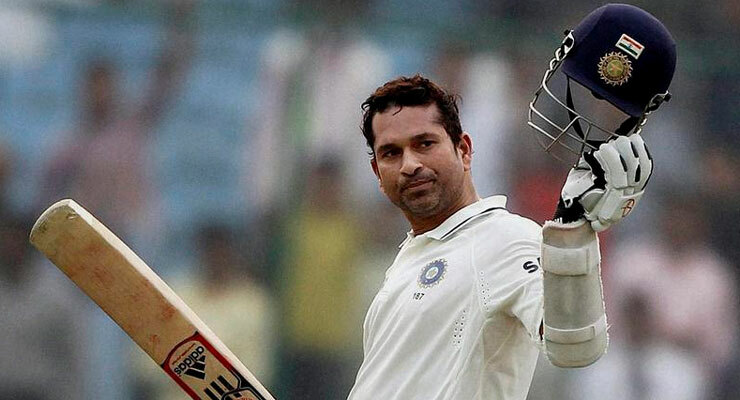 Oct 10, 2013 : Tendulkar announces his retirement from Test cricket.